Amidst all the scientific studies, academic research and political rhetoric, the debate continues on how much effect converting to electric cars – powered from our existing electrical grid – will have on the emissions of greenhouse gasses – CO2. With the proliferation of these studies, some tracing CO2 contributions all the way back to the first exhalation of breath from the dinosaurs, it can be hard for the average rocket scientist, let alone mere mortal, to come to a conclusion. Therefore, I have decided to shun the scientific calculator, eliminate the variables, and do a simple, empirical analysis of their direct impact. First, the Coal burning Power Plants. We are fortunate here in that someone, most likely math challenged, actually had the good sense to measure the CO2 output of power plants. It has been measured and confirmed many times since. Ends up the average Coal burning power plant emits 2.17 pounds of CO2 for every kilowatt-hour it produces. (EIA) Now, coal makes up only 48% of our electrical generation. Natural Gas produces 20% and it also emits CO2 (1.4 pounds per kWh). But, 30% comes from nuclear and renewable sources. So, taken together, our national electrical supply generates, on the high side, 1.51 pounds of CO2 per kWh. Basic Chemistry tells us that burning 1 gallon of gasoline emits 19.4 pounds of CO2. It also tells us, based on BTU content, there are 36 kWh of energy in that gallon of gas. One place where all the research gets bogged down is trying to account for the varying efficiencies of our automotive contraptions. Automotive IC (Internal Combustion) engines are anywhere from 15 to 28% efficient in average driving. Well, for our worst case, empirical study, I am going to assume the most efficient – 28%. The most efficient means it is the most work we get for every globule of CO2 emitted. Indeed, the meaning is that 28% of the BTUs in that gallon of gas will get turned into useful, mechanical work. All the rest are wasted as heat. There are 124,000 BTU’s, give or take, in a gallon of gas, so at 28% efficiency 34,720 of them or 10.16 kWh, are actually used for something productive. Yet, we still created 19.4 pounds of CO2 burning that gasoline. A little math, and the emissions result for our car is 1.90 pounds of CO2 per kWh of work produced. Note that at the other end of the scale – at 15% efficiency - those numbers would be 5.4 kWh of useful work, and 3.59 pounds of CO2 per kWh. Although this article is not about CO2 per mile (remember, simple), for the sake of reference, both the Chevy Volt, and my Chevy Malibu use approximately .240 kWh for each mile at a </i>steady<i> 60 Miles Per Hour. The Tesla Roadster claims to use .217. The Prius is about .220. Your dumptruck, I don't know. However, we do not need to factor in the relative mileage of different vehicles to determine the absolute CO2 emissions potential. Replacing a similar gasoline vehicle, with a similar electric vehicle will still result in similar energy needs. The results show that burning gasoline in an ICE powered car creates anywhere from 21% to 58% more CO2 than getting the same amount of energy from our electric grid for the same size and shape car. And, that point is important. The other way many of these studies tend to confuse the issue is trying to relate everything to mileage – like pounds per mile. That is truly putting oranges in an apple barrel. The matter of mileage is irrelevant when comparing similar size and shape vehicles where the only difference is the source of power. They will both use the same amount of energy, which here is expressed in Kilowatt-hours. Regardless of whether they are powered by electricity, gasoline, or soda pop. The difference lies in the source of the power. Now granted, if you replace your dump truck with a compact car, you will be emitting less CO2, but that is true of either power source, because your small car uses less energy than a dump truck. The reverse would also be true, although good luck finding an electrically powered dump truck. It should be clear by now that by replacing a gasoline powered ICE vehicle with an electric one, for the same amount of power at the wheels, we would reduce CO2 GHG emissions by anywhere from 21% to 58% - even with our existing electrical supply. And, in fact, those who have bothered to reduce some of the complex, often politically motivated and artistically spun, studies down to their basic conclusions have found exactly the same thing. Although this is not meant to be a first year physics text (there would be much more “between the lines”), before we can understand the units, we must somewhat understand the concepts of work, and force. And how the two are inter-related. We also have to understand what energy is. While energy can be an abstract concept, in our particular context energy means the potential (or ability) to do work. Work is what shifts energy from one system to another. Energy can exist in two general forms potential (stored) or kinetic (in motion). Gasoline contains potential energy. It is just “sitting there” taking up space. Once that energy is shifted to the mass of your car, by doing work – acceleration - the mass of your car then contains energy in the form of kinetic energy. It will contain exactly the amount of energy that was transferred to it. So, Energy is the ability to do work. Now, work seems a simple concept, and it is, sort of. Work, in physics, is of course mechanical work, The moving of something over a distance. If you push your car up the driveway, it is obvious you have done work. Obviously! You have done that work by transferring your bodies’ potential energy into the mass of the car, accelerating the car up the driveway. But, Interestingly, if you push and push, and the car does not move, according to the laws of physics, you have not done any work. Your energy was expended as waste heat and was not transferred to the car. Physics demands that something be moved for work to happen. Hence no work. Unfair, I know, but that’s the way it is. You have, however, transferred energy from one system (you) to another (the air) via heat. Well, in thermodynamics, there is another, broader, definition of work. Work can also be defined as the transfer of energy from one system to another. Both definitions are important to the understanding of the terms below. So work is either the movement of a mass (stuff) over a distance in physics, or, the transfer of energy from one system to another in thermodynamics. The distinction is that in Physics we are dealing with the transfer of energy by mechanical means. In Thermodynamics, energy is transferred, not mechanically, but via heat. At the risk of being overly simplistic, these are two of the four primary ways that energy is transferred. The other two are electromagnetic waves and gravity. Note there are many defined FORMS of energy – as I stated, energy as a concept is elusive – but it is transferred between systems mainly in these four ways. Work is the movement of a mass over distance, or the transfer of energy from one system to another. Force is the influence (or applied energy) that causes work to be performed. When a force acts to move an object, we say that work was done on the object by the force. That force can be electricity, and the object a motor shaft. The force can be chemical energy, and the object a piston or turbine. The force can be gravity, and the object a skydiver falling out of an airplane. Force when applied to a mass (thing) to cause a displacement over a period of time is causing work to be done. In physics, force is mass times acceleration. (F=ma). So, force is an influence that causes an object to speed up or slow down (i.e. accelerate or decelerate), or that causes work to be performed. And, finally, there’s power. Power is a measurement of how fast that object is speeding up or slowing down, or how fast energy is being transferred between systems. In other words, how much work is being done? As we all know, the more power we have, the faster the work is done. Conversely, the faster a certain amount of work is done, the more power is required, and the more power has been used. Power equals work divided by time (P=W/T). Power is an aggregate of all the former terms. It is the measurement of the final result, so to speak, of using energy to apply a force to do work. So, if work is defined as moving (accelerating or decelerating) something, then force is what causes it to happen. Energy is the push behind the force, and power measures how much work has been done. But, you came here to learn about the units we measure this stuff with, right? Well, if you are still here, we are about done! We measure the quantity of energy (or force) with the units Kilowatt hour, BTU, or Joule. These are all measurements of “units of energy”. Conversely, the same units can be used to measure how much energy a process has used. We used so many BTU’s of fuel, so many Kilowatt-hours of electricity, or so many Joules of energy. If energy were water, the equivalent unit would be the gallon. There are 1055 Joules in a BTU, and there are 3414 BTU’s in a Kilowatt-Hour. We measure the amount of work that is done with units of power. The Horsepower, the Watt, or the BTU per hour (BTU/Hr). In our water example, these would be equivalent to Gallons Per Hour. A horsepower is a unit of power sufficient to raise 550 pounds One foot in 1 second. Equivalent to roughly 745.7 Watts, or 2,546.6 BTU/Hr. There you go! So much background. Well, the concepts I briefly explained (and it was brief) before defining those terms, are extremely important to all fields of energy. They are the foundation principles. The above explanation only scratched the surface. I will finish this up with a couple of examples. First with water. The garden needs to be watered with a gallon of water every hour (big garden). This is the amount of energy (water) we need. SO we will be doing work at the rate of one gallon per hour. At the end of ten hours we will have used ten gallons (units) of our energy. Now lets make the garden a 100-watt light bulb. We need 100 watts of energy every hour to light our room. So we will be doing work at the rate of 100 watts of electrical energy every hour. At the end of ten hours we will have consumed 1 Kilowatt hour (1 unit) of electrical energy. Our Furnace needs 50,000 BTUs of energy every hour to keep our toes toasty. So we will be doing work at the rate of 50,000 BTUs per hour. At the end of ten hours, we will have consumed 500,000 BTU’s (units) of energy. I am going to elaborate on that last example, lest you think this is all academic. Simple math tells us that car is getting 30 MPG on the highway. So, how much horsepower did we need from the engine? Well, if you have been attentive, you would realize you divide that 248,000 BTUs by the amount of BTUs in one horsepower and get 97 Horsepower. Right? Well, sort of, but wrong. In the average gasoline internal combustion engined car, 75% of those BTUs were wasted, they did not make any horsepower. The went out the tailpipe, and kept your radiator warm. SO, the correct way to do it is to take 25% of those BTUs, 62,000 (which is what was actually used to make Power), and divide by 2,546.6. Which gives us 24 Horsepower. And, that indeed, as a rule of thumb, is what the average 30 mpg car needs to go down the road at 60 MPH. In 2008 this country used 23.2 trillion cubic feet of natural gas. Of that 2.9 trillion cubic feet was imported, primarily (90%) from Canada. Here are the pertinent figures from the EIA (Energy Information Administration). LNG – Imports: 416.8 Billion Cubic Feet. The United States is the Number one consumer of Natural gas, and the worlds second largest Producer. We have the 5th largest amount of proven reserves, and we are the number one importer, importing 17% of our natural gas consumption in 2008. Five states: Louisiana, New Mexico, Oklahoma, Texas, and Wyoming, currently produce about 80% of our domestic natural gas supply. The existence of pipelines is a very important part of natural gas recovery. Indeed, if natural gas is produced by a well, and there is not a nearby pipeline to transport it, it is often burned off. Natural gas cannot reasonably be transported by trucks, or ships until it is either compressed into CNG, or liquefied into LNG. CNG is natural gas compressed to less that 1% of it’s volume, and is usually stored in tanks at about 2200 PSI. In terms of energy content (energy density), CNG takes up about 2 times the volume of LNG, and 4 times the volume of diesel fuel. LNG is natural gas that has been cooled to about minus 260 degrees Fahrenheit. At that temperature natural gas becomes a liquid. It has to be maintained at this temperature in special cryogenic (refrigerated) tanks, which adds to the high cost of LNG. While not as complex as Crude Oil refining. Natural gas from the well is nowhere near pure. It has many other constituants from water to natural gas liquids (liquids closer to our familiar petrochemicals).. These have to be removed via various processing stages before the gas (now called dry gas) can be placed into a pipeline. The actual methodology of quantifying and classifying reserves is rather complex. I am going to use the EIA's system (also used by the Natural Gas Association). I am also going to simplify a bit. In discussions, these distinctions are important, because various people will quote different numbers often to support a claim. There are also various different organizations with different estimates, albeit they normally end up pretty close. The widest measure is the total estimated Resource base. This is an estimate of all possible estimated gas. For the US, this number is 1,747 trillion cubic feet. The vast majority of this gas is unrecoverable for various technical reasons. But the number pops up. It can be ignored! US Unconventional Reserves - 644.9 Trillion Cubic Feet. It is important to note, that according to the Natural Gas Association, Tight Gas is extremely hard to extract. As to shale gas, the above number is from EIA. The Federal Energy Regulatory Commission (FERC) puts the estimate at 742 Trillion Cubic Feet. However, according to the Natural Gas Association it is expected only about 10% of the shale gas can actually be extracted (Produced). A recent (December 2009) report on Gas shale was produced by Advanced Resources International and presented at the United Nations Climate Change Conference. This report focuses on the “Magnificent Seven” North American Gas Shales – the primary resources on the North American Continent. 5 are in the US, and 2 are in Canada. They reached the following conclusions as to our North American Supply. According the EIA (Energy Information Administration), in 2008 our homes accounted for 21% of all natural gas use in this country. 29% went to generating electricity, and another 29% went to industry. The rest went everywhere else. Fortunately, it would appear that our efforts to improve the efficiency of our homes and heating equipment is paying off. (It may also appear that our winters are getting warmer, but, that is so much another topic for another day). According to the EIA data on residential use of Natural gas, our residential consumption has stayed nearly constant since 1966. In fact, in many of those years it has actually gone down a slight amount! In 1966, residential customers used 4,138 Billion Cubic feet ot Natural Gas. In 2008 they used 4,866 Billion Cubic feet of the stuff. Here is the data. This data agrees with both other EIA documents and the Natural Gas Association. This is despite the fact that our population has grown by over 100 million people, And despite the fact that the number of single family homes has at least doubled. Indeed ,The US census reports that in 1970 there were 46,790,055 single family homes and townhouses in the United States, By the 2000 census that number had increased to 76,313,410. Although the actual figure is not available for 2008, it is safe to assume a modest increase since then. So, what has caused this? Good question, and I certainly don’t have the definitive answer. I do know that According to the Natural Gas association, 51% of all homes in the US are heated with natural gas. They state that percentage has remained relatively unchanged during this period. So, it must be something else. Well, furnaces are getting more efficient. From the old clunkers of the past at 80% efficiency, to modern condensing furnaces that are better than 92% efficient. But, there are many older furnaces still out there. Only in 1992 was the Annual Fuel Utilization Efficiency required to be 80% or better. New standards are going to bump that to 90% soon. And, we have certainly been making our homes more efficient. According to the EIA, the efficiency of our homes has improved by 35% between 1980 and 2005 from 65,000 BTU per square foot to 41,000 BTU per square foot, annually. So, we have twice as many homes, using the same amount of gas. Have we improved our overall efficiency by 50 percent? As I said at the beginning, that is a subject for a future discussion. For further reading. Here is an article about Furnace efficiency standards. Where does electricity come from ? Electricity is not a source of energy. It is a transport mechanism, and way to move energy from one point to another. Along the way, the energy gets converted many times. Each time, there is a little energy lost. Electricity is generated by an energy source - Coal, wind, water power, nuclear reactions, etc. The energy derived from these sources is then converted to electricity by a power plant, or generation source. This may seem to be a trivial distinction, but it is very important in understanding how we use energy. Let's take one example. A power generation station burns coal. That coal creates heat, which heats water into steam. The steam then turns a turbine which converts the heat into mechanical energy to turn a generator which converts that mechanical motion into electricity. The electricity travels across the distribution grid to your home, through the wires inside your home to your washing machine. Inside the washing machine a motor converts that electricity back into mechanical motion to wash your clothes. It is also an important note that electricity cannot be stored by our national electric grid. Literally every time you turn that washing machine on, a generating plant - somewhere - starts making a little more electricity to make it run. An amazing thought - but one that is important to many of our discussions of alternative energy. It is the function of operations centers and their computer systems throughout the country to balance this supply and demand. Not being able to store that electricity makes a significant impact on how we generate it. First impact is, we have just enough generation to meet the demand. It does not make economic sense to build a power plant to create electricity that is not needed! So, if we, as a country, start using a lot more electricity, someone will have to invest in building a power plant to meet that new need. For example, a widespread acceptance of plug-in hybrid cars would use more electricity. Someone will have to build more power plants to meet that need. A large power plant is only efficient (makes a profit) if it is running at near it's capacity. This is true of Coal and nuclear plants, and somewhat true of hydroelectric (since they still have to be maintained). This gives rise to power companies supplying two kinds of generation capacity. Baseload is the average amount of electricity this country uses 24/7. This is the demand that large scale plants are built to supply. However, there comes a time most every day when our demand exceeds that. It is most often in the late afternoon, early evening. This additional demand is called Peak Load. Power companies maintain many, many, small power generators called "peaking plants". These plants can be quickly brought "on-line" to supply that excess energy. Most of these Peaking plants are run by gas turbines, similar to a jet engine. They supply around 1 - 3 megawatts of power each. Most of these turbines are powered by natural gas. The majority of the natural gas that is used for electricity generation in this country is used to run these "peaking plants". Since we cannot store the electricity, control is very important. Power companies have to be able to not only increase the supply as demand goes up, but reduce that supply as demand goes down. They do this in real time. As the washing machine example above shows, it is an amazing process. The need for this control has a large impact on our ability to incorporate variable electricity sources such as wind power. We cannot just hook up large electrical supplies to our national grid. They must be controllable. Smart Grid technology is one way the power companies hope to allow better control, and the addition of many small power supplies to our grid - Distributed generation. But, I digress. Let us first look at what supplies this country with electricity, and then where all that electricity goes. This country has a total grid connected generation capacity of slightly more than 1,000,000 Megawatts (1,000 gigawatts). Additionally, many companies and factories generate their own power. To that end there are an additional 8,000 megawatts of privately owned generators that are not connected to the grid, and 12,000 megawatts of privately owned generators that are connected to the grid. A note about the above. The generation capacity cited is from the EIA, and called "nameplate capacity". That is the maximum amount the particular generator CAN produce. However, breakdowns, planned maintenance and repairs, and other factors (such as a lack of fuel) reduce the amount of energy that is actually available. This is called Capacity Factor. Various technologies have different capacity factors. In 2008, For Coal that factor is 72%. For nuclear it is 91%. Combined cycle gas plants achieved 42%, while single cycle stood at 10%. All renewables together were at 37%. By my figures, the average across all types of generation plants is currently about 55%. This makes our total actual generation capacity at about 550,000 megawatts, or 4,818,000,000 megawatt-hours per year. Nuclear power plants supply about twenty percent of our electricity. Natural gas accounts for 21% of our generation - Much of this as a fuel for Peaking Plants. Hydroelectric plants comprise six percent of our capacity. Renewable energy sources - besides Hydroelectric - comprise 2.5 percent of our capacity. Contrary to some beliefs, very little petroleum is used for generating electricity - about 1.9%. Much of that petroleum is used in places where Diesel Generator plants are the only reasonable source of power. In 2008, this country's electric plants generated a total of 4,110,259,000 Megawatt-hours of electricity. And, we used every last watt of it. This represented 86% of our total electrical generation capacity based on my calculation of average capacity factor. Another way of looking at it is we have a 14% safety margin. Well, where did it all go? There are 123,949,916 residential electricity users in the US. The average residential consumer uses 949 kilowatthours (KWh) of electricity a month. (Your mileage may vary). That electricity costs an average of 10.65 cents per KWh. There are 17,377,219 commercial customers who each use an average of 6,408 KWh per month at an average 9.65 cents per KWh. Finally, there are 793,767 industrial customers in the US. They each use an average of 107,907 KWh a month at an average cost of 6.39 cents per KWh. About 215,000,000 megawatt-hours (MWh) of electricity were used for lighting by the residential sector. This was equal to 5% of total U.S. electricity consumption. 311,000,000 megawatt-hours were consumed for lighting of commercial buildings. That is 7.5% of the total. The EIA Electric Power Summary for 2008. - Good reading! Appliances account for 64.7% of electricity consumption in the average American household in 2001. Refrigerators consumed the most electricity (14%), followed by lighting (9%). 1 Gallon of Gasoline equals 33.7 KWh of electricity. 1.012 kg (2.2lb) of Hydrogen equals 1 gallon of gasoline. 1kg of hydrogen compressed to 2200 PSI takes 2.8 Cu Ft of volume. A British Thermal Unit (BTU) is the amount of heat energy needed to raise the temperature of one pound of water by one degree F. This is the standard measurement used to state the amount of energy that a fuel has as well as the amount of output of any heat generating device. In the context of heating devices the output is normally express in BTUs 'per hour' (BTU/h). The BTU has largely been replaced by the Joule in scientific circles. It is still widely used however when comparing fuels, and in various industries. A BTU is a fixed amount, or quantity, of energy. BTUs 'per hour' (BTU/h) is a measure of the amount of work done. The history of US Oil consumption. US Oil Consumption through history. In a fit of nostalgia this morning, I thought it might be interesting to look at the history of energy consumption in the US. Despite conservation, we are using more and more energy every year. This is not entirely a bad thing. That energy is powering an ever expanding array of technology that is making our lives easier, more enjoyable, and more productive. While we certainly need to reduce our use of oil, and convert to alternative and renewable sources of energy across the board, Let us not condemn our lifestyle or our technology We should rather find a better way to power it. When we discover Warp Drive, or transporters, or even the Holo-deck, they are going to require vastly more amounts of energy! Total input to refineries is how much Crude oil (only) was used. It Does not include imported gasoline or additives. It can, however, include crude oil input from storage stockpiles, so it may be larger than imports & domestic production. Actual Crude oil imports will be 6-8% less than this. Total imported Crude is imported crude oil only from all sources. Total domestic production is the amount of crude oil the US produced that month. I have also included daily average gasoline and diesel consumption during that month. Below is a sampling of how much Oil this country used during various times in it’s history. I gathered this information from a wide variety of sources, including my own personal collection of old books and encyclopedias. These are averages, and reported in Barrels per day. I will start at the present, and work our ways back, because that is how I want to do it. Note: Numbers for some of the older data have been estimated as concise data does not appear to exist. Where denoted as actual, they are derived from 'hard' data. Note: The amount of oil used, and the fact we imported a portion from Mexico surprised me. This data was based on an old newspaper article I found. Seen notes below for the link. 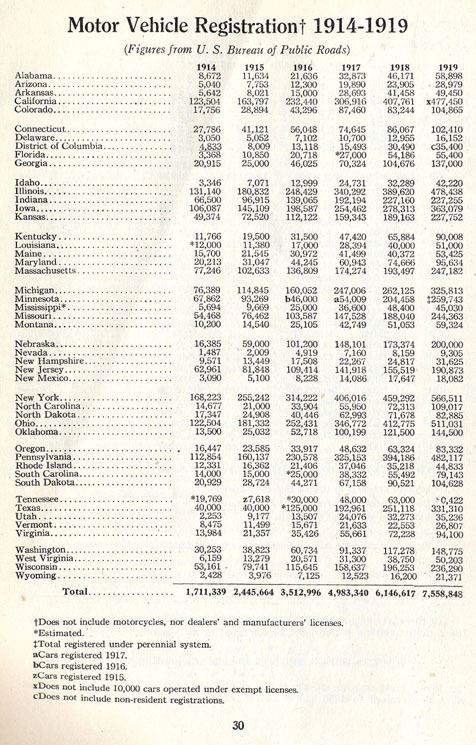 Figures for 1920 are primarily taken from a March 13, 1921 article on Oil in the New York Times. Gasoline consumption for 1934 was estimated from a letter to the Editor of Time Magazine Jun 10, 1935. Comm Aircraft is Commercial pasenger aircraft (air carrier) It does not include General Aviation. Where does all our oil go? When we mention Oil, most people think "gasoline". While it is true that about half of the crude oil we use every day gets refined into gasoline, that is only half of what we use. What does the other half do ? The purpose of this exercise is to figure out where all that oil goes, and what it is used for. All crude oil has to be refined before it is used, so we will look at what came out of our refineries. We will use October of 2009 as an example. US refineries supplied 543,158,000 barrels of products in October 2009. That is about 17,521,000 Barrels per day . We're gonna see what those products were, but first, a short word from the bean counter (me). One other note. A refinery experiences something called refinery gain. Due to various things such as additives, the output of a refinery is approximately 5-8% more than the crude oil inputs. This is why, while refineries used 504,607,000 barrels of crude (16,277,000 bbl per day), they produced 543,158,000 (17,521,000 Barrels per day) of product in October 2009. So, lets now take a look at what came out of those US refineries in October of 2009. These numbers are the total for the month of October 2009. Refinery losses: -30,000,000 bbl (That's a minus, stuff that didn't turn out quite right). Still gas is NOT used to power a moonshine factory. It is gas that is emitted from the refining process. Since refineries use heat for many of their operations, in a move of thoughtful conservation, most of this is used to provide heat for the process. OK. Ignoring those minor refinery losses, lets do the statistical thing, and create some quotable figures. 49% of our crude oil went into our gas tanks as gasoline. 22% of it went into trucks, farm and construction equipment, etc - Diesels. 7% went into our fleet of airplanes. Seventy Eight percent of the oil we used in October 2009 was used for transportation. But, 22% of the oil we used in October went to non transportation use. In industry, making plastics, pharmaceuticals, lubricants, roads, and a thousand other products. Some of it went to our propane gas grills, and that is good. Occasionally, I get the impression there is some confusion about where our oil actually comes from. Many people seem to think we have a pipeline to the Persian Gulf (The "Middle East") and that we get all of our oil from there. It might surprise these folks to learn that the "Middle East" supplies us with less than 10 percent of our oil. Rather than discuss random numbers, I decided to look at the actual figures for one month - October 2009. A companion piece to this will take numbers from the same month to show where it all went. All of the figures are from the EIA (Energy Information Agency). It is important to remember we import not only Crude Oil, but other petroleum products. The numbers here for imports do not separate the two. In October of 2009 the Total US Domestic Petroleum usage (Crude oil, products, and going to stockpiles) was 504,607,000 barrels. That works out to 16,277,000 barrels per day. Each Barrel is 42 gallons. Of course we don't actually USE barrels to ship oil, but the nomenclature remains. Of that amount, 44% of it came from our own country. Note that while Alaska used to supply a lot of our domestic oil, the amount has been getting less each year. It now amounts to a small fraction. Most of our domestic oil comes from hundreds of small producers around the country. The US is unique in allowing private persons to own Oil rights. In most countries, oil belongs to the Government! See the bottom of this post for further info on that. One thing to note is the production from Alaska. While Texas has historically been the largest US producer of oil, through the 1980's Alaska rivaled them. The Alaskan North Slope fields, beginning in 1977, had a peak production during the 80's of nearly 2 million barrels of oil a day. In 1980, that was a major portion of our production and consumption. Since that time, however, the production has fallen rapidly as the Alaskan Slope oil fields are depleted. Today, they are producing about 600,000 barrels a day, 12% of our domestic production. There is also some confusion about OPEC. Many people equate OPEC with "Middle East" or Persian Gulf. In fact, while most Persian Gulf countries are members of OPEC, there are many OPEC members who are NOT in the Middle East. Two of our largest suppliers - Venezuela and Nigeria, are members of OPEC, but they are not in the Persian Gulf Area. OK, I will stop talking. Here are the numbers……(These are for the ENTIRE month of October!) These number include both Crude Oil, and a smaller amount of petroleum products imported. OK. We find that 66% of our oil and products in that month came from imports. 9.4% of the total oil we used came from the Persian Gulf - 14% of our total imports. 90.6% of the oil we used came from places NOT in the Persian Gulf - 86% of our total imports. 28% of our total oil came from OPEC countries - 42% of our total imports. 72% of our total oil came from NON-OPEC sources (including the US) - 58% of our total imports. Of course we import oil from dozens of countries. Many supply only a small fraction of our use. We saw the numbers for the Persian Gulf above. Below are listed some select suppliers from other parts of the world. I think the most significant thing to note from this list is the amount of oil we get from Canada and Mexico - 108,373,000 bbls. Our neighbors supply us with 32% (1/3) of all our imports. The other thing to note is Venezuela. That country, who is not real friendly with us (but who likes to sell oil) supplies us with just as much of our oil as Saudi Arabia. Interesting tidbit. CITGO is Venezuela-owned and US Incorporated. (http://en.wikipedia.org/wiki/Citgo). Now, that note about US ownership of Oil Rights. In most major oil producing countries, the government owns the rights to Oil resources. The US is nearly unique in allowing private ownership of resource rights. Private landowners contract with producing companies, and the entire deal is between the landowner, and the producer. Most producing companies compensate the landowner with royalties on each barrel of oil produced. The only place the government gets involved at all is restrictions for well spacing, and environmental standards. This situation gives rise to thousands of independent producers, as well as the existence of "Stripper wells" which produce less than 10 barrels a day. According to EIA, these stripper wells account for nearly 75% of all wells in the US. They currently produce about 900,000 barrels a day, or 27,000,000 per month. This is about 16% of total US oil production. You may know someone with one of these wells on their property. is the oldest major global oil producer - and the first. has produced more oil, cumulatively, than the current reserves of any country but Saudi Arabia. The below data is taken directly from EIA (Energy Information Agency) reports. It is the AVERAGE number of barrels (in thousands per day) imported from the top 10 sources. This list accounts for 85% of all crude oil imported to the US.